Geneva College's Library is named in honor of Dr. Clarence Edward Macartney, an influential evangelical minister of the early twentieth century. Built in the collegiate Gothic style, the stone structure was erected in 1930 and enlarged in 1965. Along with its main collection, which helps to support the curriculum of the College, the Library's holdings include several special collections, among them the Covenanter Collection, which is comprised of materials about the Reformed Presbyterian Church of North America and its origins in Scotland; the Geneva Author Collection, a collection of the writings of the College's faculty, staff, alumni, and students; and a collection of Dr. Macartney's own books and memorabilia. McCartney Library is committed to providing equal access to library resources and services for all library users. For library collections that are not accessible, we are committed to providing reasonable accommodations and timely access for users with disabilities. For more information, visit the Student Success Center. McCartney Library is a member of OCLC, the Online Computer Library Center, through which it has access to 50 million library holdings worldwide. The Library also participates in Access Pennsylvania, a computerized catalog and interlibrary sharing partnership of more than 2,100 libraries throughout the state, and is a member of the Keystone Library Network. The Library provides space for students to read, study, and write papers at tables and carrels throughout the building. The two large reading rooms on the first floor are the most inspiring. Soaring ceilings end with eighteen-panel stained glass windows that depict two famous works of Christian literature: Bunyan's Pilgrim's Progress (1678) and Milton's Paradise Lost (1667). The windows were produced by Henry Lee Willet (1899-1983) of the Willet Studio of Philadelphia. Drs. 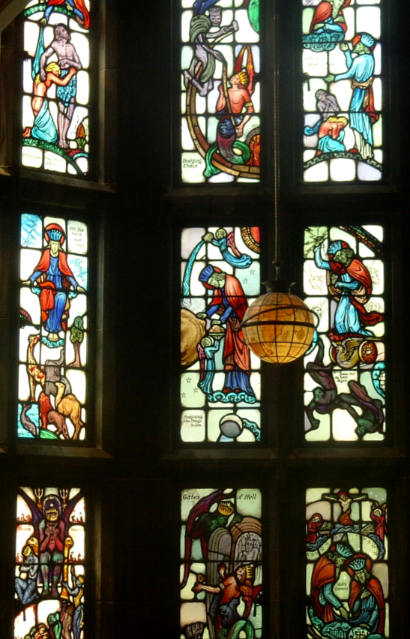 Shirley Kilpatrick and the late Howard Matteson-Boze, professors in history and humanities, interpreted the meaning and beauty of the windows in two books with detailed images of each pane. One of the library′s most recognizable features is the tower above the entrance which houses the bell carillon. Quarter-hour chimes ring across campus and the solemn bass note tolls the hours. The 14-bell set, ranging from 350 to 3,000 pounds, was fashioned in 1930 by Baltimore′s McShane Bell Foundry, and they would be nearly impossible for Geneva to afford in today's market. Each bell has two inscriptions: one from the Psalms and the other from "Ring out, Wild Bells," a part of Tennyson's poem In Memoriam. Read about the inspiring history of the library in a blog post by Dr. William Edgar. The Bell Tower newsletter provides updates on collections and people in the library. If you have questions about the library, or anything else, please don't hesitate to Ask a librarian!